The Condor Outdoor Cobra CBT Dual Bungee Sling is a revolutionary sling from Condor Outdoor. 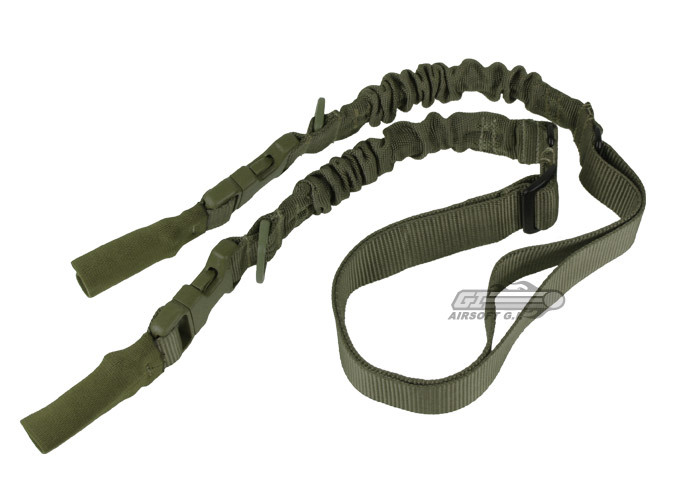 This sling can be converted from a 1 point to a 2 point bungee sling in seconds. This is the highest quality sling Condor Outdoor has ever produced because its made right here in the U.S.A.! It features a 1.25" webbing with Duraflex buckles. Also, a snap hook adapter covered with elastic and a side-release buckle to release adapter and sling. This sling is one of the most modular slings on the market and I love it!!! Its bungee construction and multiple connection point allow this product to be used in every situation. It can be a 1 point sling, 2 point sling, attached to a chest rig for direct support, attached to a backpack or any sort of ring you want. This sling will do anything you want it too. Also it is pretty damn comfortable when it comes down to it. This is an excellent sling, it can transition from a two point to a single point in seconds! The OD color is a very bright, but with some dirt that will surely become less of an issue. The detachable clips seem very sturdy. It is however extremely long, even at the shortest setting it is barely short enough for my sniper rifle. There aren't really any other cons!